The Winnipeg Jets continue a four-game homestand, their last of the season, tonight when they host the New York Islanders at Bell MTS Place for the only time during the regular season…The Jets lost 5-2 to the Dallas Stars on Monday to fall to 1-1 during the homestand…Winnipeg plays their last home game of the regular season on Saturday against the Montreal Canadiens. The Jets clinched their spot in the 2019 Stanley Cup Playoffs with their win on Saturday night against the Nashville Predators…It’s the first time in franchise history that the Jets have reached the playoffs in back-to-back seasons…Winnipeg has a two-point lead on the Predators for first place in the Central Division with a game in hand…The magic number for the Jets to clinch its first divisional title since relocation is nine…If the playoffs started today, the Jets would host the Dallas Stars, who hold the Western Conference’s first wild card spot, in the first round of the playoffs. Winnipeg has the fourth-best home record in the NHL this season at 25-10-4…The Jets have points in 14 of their past 18 home games (12-4-2), which included a seven-game winning streak from Jan. 6-Feb. 2…The Jets have the best power play at home in the NHL this season at 31.6% and have scored a power play goal in six of their past seven home games (6-for-20, 30%)…Winnipeg’s 37 power play goals at home this season is second in the NHL…The Jets have a 57-16-6 record at Bell MTS Place during the past two seasons, which is the third best home record in the NHL…The Jets have scored 146 goals at home this season, which is third in the NHL, and have outscored their opposition 118-59 in their 25 wins. The Jets are 18-10-2 against Eastern Conference teams this season, including 11-4-0 against the Metropolitan Division…Winnipeg went 19-7-6 against the Eastern Conference last season, including a 10-3-3 record versus the Atlantic Division and 9-4-3 record against the Metropolitan Division…The Jets are 5-2-1 in their past eight games against an Eastern Conference opponent…Blake Wheeler (10G, 27A) leads the Jets with 37 points in 30 games against the Eastern Conference, including 19 points (6G, 13A) in 15 games against Atlantic Division teams. March and April have historically been successful months for the Jets, as the team has gone 85-56-15 in those two months since relocation…During the past three seasons, the Jets are 35-13-2 in March and April, including a perfect 8-0-0 in April…Blake Wheeler is the franchise’s leading scorer in March with 121 points (47G, 74A) in 131 games…Goaltender Connor Hellebuyck is 18-8-2 in March during his career with a 2.60 goals-against average and .920 save percentage. The Jets have been outshot in four of their past six games and 10 of their past 11 home games…The Jets are 28-16-4 when being outshot this season, which is the second-best record in the NHL next to the Islanders at 30-10-6…Winnipeg has a negative shot differential in every period this season, but have a plus-17 shot differential in overtime, which is third in the NHL. Kyle Connor is the NHL’s reigning first star of the week after he racked up eight points (5G, 3A) in three games, including his first career hat trick on Saturday against the Nashville Predators…Connor continued his torrid pace with a goal and an assist on Monday against Dallas…He has a career high 33 goals, 30 assists and 63 points this season…Connor has 19 points (11G, 8A) in his past 17 games, which includes six multi-point games. Defenceman Jacob Trouba has five assists in his past five games…He has a career-high 38 assists, which is 13 more than his previous career best from the 2016-17 season, and leads Jets defencemen in scoring with a career-high 44 points. Patrik Laine scored on the power play on Monday to reach 30 goals for the third consecutive season to start his NHL career…He’s one of only four players in NHL history to have three 30-goal seasons before turning 21 years old, joining Wayne Gretzky, Dale Hawerchuk and Jimmy Carson…With Mark Scheifele (35) and Kyle Connor (33) also scoring 30 goals this season, the Jets are one of six teams in the NHL with three 30-goal scorers. The Jets have won three of the past four meetings with the Islanders and have points in four of the past six games (3-2-1). Winnipeg is 12-for-13 (92.3%) on the penalty kill in the past four games against the Islanders. The Jets have scored a power play goal in eight of their past nine games against the Islanders (9-for-34, 26.5%), including four consecutive games at Bell MTS Place. Bryan Little leads the Jets with 22 points (8G, 14A) in 31 career games against the Islanders. Nikolaj Ehlers has six points (2G, 4A) in seven career games against the Islanders, while Kyle Connor has four points (1G, 3A) in three games. The Islanders are one of two teams that Patrik Laine hasn’t scored against in his career – the Columbus Blue Jackets is the other. Goaltender Connor Hellebuyck is 3-1 with a 2.52 goals-against average and .922 save percentage in four career starts against the Islanders. Jets General Manager Kevin Cheveldayoff is a former draft pick of the New York Islanders, 16th overall in the 1988 NHL Entry Draft. Islanders defencemen Ryan Pulock is from Grandview, Manitoba and played his junior hockey with the Brandon Wheat Kings. Islanders head coach Barry Trotz is originally from Dauphin, Manitoba. 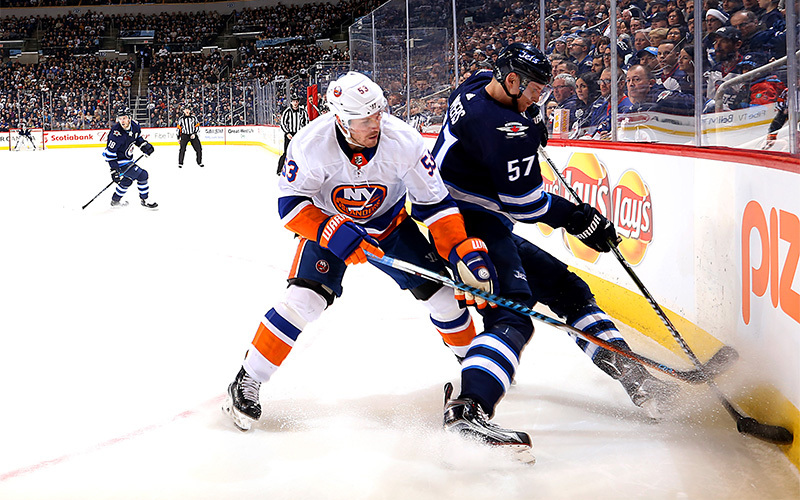 Islanders forward Andrew Ladd was the captain of the Jets from 2011-2016 before being traded to the Chicago Blackhawks for Marko Dano and a first-round pick in the 2016 NHL draft, which was used to trade up to select defenceman Logan Stanley. Jets forward Blake Wheeler and Islanders defenceman Johnny Boychuk were teammates with the Boston Bruins for parts of three seasons from 2008-2011. Jets defencemen Josh Morrissey and Islanders defenceman Ryan Pulock suited up together for Canada at the 2012 U18 World Championship, winning a bronze medal. Jets forward Kyle Connor was selected 17th overall in the 2015 NHL Draft, one spot after Islanders forward Mathew Barzal. Jets forward Matt Hendricks was teammates with Islanders forward Jordan Eberle when they played for the Edmonton Oilers from 2014-2017. Jets defenceman Nathan Beaulieu was teammates with Islanders goaltender Robin Lehner when they played for the Buffalo Sabres last season. Needs one game played to reach 300 for his career. Needs six points to reach 200 points as a member of the Jets.